When you have any questions about your Transporters.io system there are occasions that are best handled by seeing things directly or assisting with changes rather than just talking. Your Transporters system is secure and private to your company and you should keep your login details safe, not even sharing them with our support staff. To help with this we have created a secure way that you can authorise and allow access to our support team as and when you want, without needing to provide your username or password. 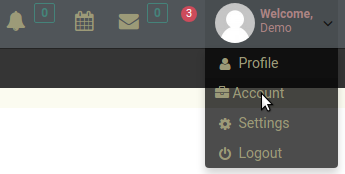 Login to your Transporters system and click on your name in the top right corner. Under "Your Account" find the Support Code section. You will either see a Support Code or you will see that Support Access is disabled. Click "Create or refresh support code" to generate a new Support Code that you can provide to our support staff to temporarily access your system. Provide the generated code via any of our Support Channels. Once the matter has been resolved you can refresh or clear the support code to prevent any future support logins to your system. By generating and providing a support code you immediately consent to and authorise the Transporters support team to view and access your system. 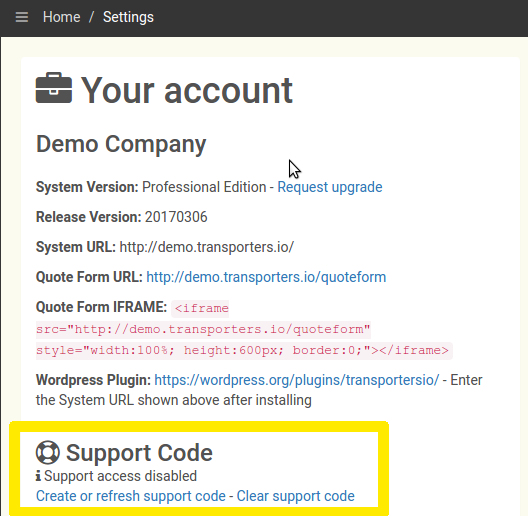 Support codes can only be used by authorised staff members of Transporters.io. Possession of the code by itself will not allow anyone to access your system, this is an additional security measure to provide safe and controlled access which can only be used through our internal support systems.